Make no mistake: before the nation’s best and brightest student-athletes are competing for us, we are competing for them. Based upon a feasibility study completed in July 2014, in September 2016, the Southeast Addition and Renovation for the Memorial Stadium project was approved with a budget of $4,673,470 to initiate the schematic design and design development phases of the project. At that time, it was expected that the project would consist of significant improvements to the existing east side of the stadium, removing the existing “horseshoe” seating area and building a new football operations addition at the south end of the stadium. 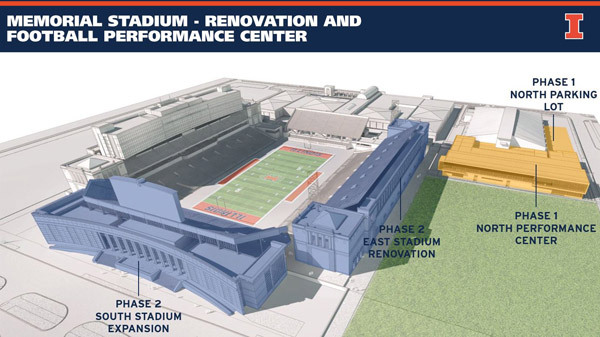 The schematic design phase confirmed the need for the updates, but revised the plans to include a new Football Performance Center immediately east of the Stadium for Phase 1. Phase 2 would consist of other Stadium renovations and the potential replacement of the south “horseshoe”. 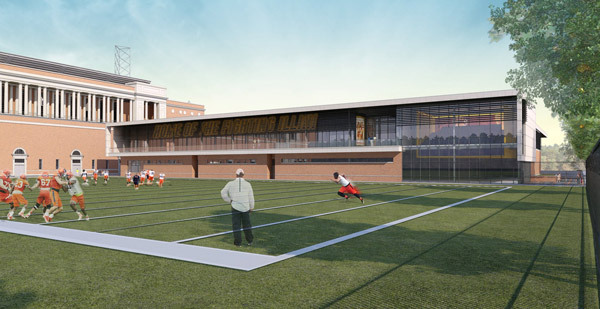 Based on the completed schematic design phase, the cost to successfully complete the Football Performance Center (Phase 1) of this project, including the design and construction, will require a budget increase of $74,526,530. To recognize the new composition of the project, the intent is to rename the project Memorial Stadium Renovation and Football Performance Center. Accordingly, the Chancellor, University of Illinois at Urbana-Champaign, and Vice President, University of Illinois with the concurrence of the appropriate administrative officers recommends that the Board approve the increase in project budget for Phase 1 to $79,200,000, an increase of $74,526,530. $79,200,000 is a massive amount for this project!! I'm excited to see the plans. Tennessee's Anderson Training Center (one of the facilities JW visited) only cost $45 mil and looks great. You have to factor in cost of doing business in Illinois but this should put Illinois near the top in football facilities. As the Football Performance Center is a separate building - can we get a corporate sponsor and give naming rights? My guess is JW is way ahead of me here. I think the more likely scenario is soliciting a huge donation and naming it after an individual/family. (Like Ubben for the basketball facility). They have added new details about the Performance Center and Phase 2 Memorial Stadium SEZ update. Looks great! I think this is a much more reasonable way to structure this renovation. Gets us updated in arms race, as it looks to be on par with recently built similar facilities. And solves that oh-so-terrible locker room to Irwin walk problem, too! Paves way for South endzone fix that doesn't require football facilities awkwardly sandwiched in between seating and public areas. I wish they'd add a phase 3 that either tears down the north end zone and starts anew or renovates it to connect with the rest of the stadium. It was absolutely awful sitting there as a student feeling like you were being intentionally sequestered away from the rest of the fans and the games. Poor design. Re: the east side and horseshoe: "A timeline for the stadium renovations will be announced at a later date." So, basically the same plan that we've had since 2005 or so. It'll help catch us up, but IMO it's keeping up with the Joneses. Hopefully we have a football program befitting of the better facilities in a few years. I can't agree more. The separated block looks terrible. Should've planned it to match a future horseshoe renovation. I can't believe that they are going to build this in front of the stadium. Of all the area around MS, the view of the stadium and columns shouldn't be further obstructed. Just a strange decision in my opinion. Phase 1 looks kind of like a bit of a hack job, not quite an elegant solution. Slowly engulfing the whole stadium. Just keep building around the perimeter to bury the original. And the Marching Illini will then be parachuted in to make their entrance. I love the positivity, keep it up guys. Having gone through a few renovations now on IL, I realize literally every single person is going to have a different opinion on this. But where else did you want the new facility to go? Really the only other option was to build it in the south endzone, which is too restricting, or build a facility further away. Both of those options have more negatives than simply obstructing less than 1/4 of 1 side of the stadium. Plus, Grange Grove with the columns as a back drop is one of the most picturesque places in all of college football IMO. Also, I'm sure Whitman will more than make up for the obstruction by building a grand south entrance. Threw together a rough picture of how it will fit there. Um, we built the Undergrad Library underground so we wouldn't shade the Morrow Plots. Why not do the same for this? Just think, picture windows to look out over an atrium and a view of the picture windows on the other side of the atrium. OK, it's not a view of Lake Michigan, but the current Phase 1 doesn't have that either. And it wouldn't mar the aesthetics of the stadium. I'm almost serious about this. The south wasn't the only other option. They are putting a parking lot on the east side of the indoor facility - why not utilize that area vertically?. Look at how they surrounded and enclosed the armory. That could have been done at Irwin. Extend over into IMPE and let IMPE expand more to the west. And yes, if you have to extend over in front of the stadium - sub grade is an option. This seems to lack creativity - that is my critique. The problem is, they probably investigated all of those options and it wasn't feasible for one reason or another - I don't know that. At the surface, I just don't like it. I'm not a huge fan of how the exterior looks, then couple that with the fact it does block part of the stadium. Seems like an awful lot of money for ~ 2 stories. I'm assuming the bulk of the expense will be the finishing touches put inside? Agree and have similar thoughts - it's probably naive(I hope) to think they didn't do a thorough analysis of their options. Must've come to the conclusion this is our best bet. Would love to hear Chalmers' take. While it may be practical, for a university and state as architecturally as rich as ours, this is weak sauce. If the real estate is so scarce there with IMPE in the way, then go vertical or build a new IMPE across first and put the land IMPE uses to use. They just spent about $77 million renovating and expanding IMPE (now called the ARC) about 9 years ago. Not gonna happen. Count me as among those that are not impressed. I realize we are not flush with cash, but sometimes it's better to wait than to do things things half a$$ed. We have a beautiful stadium (have you seen places like Purdue or NW???) and grand sweeping views. This facility will cover up at least a portion of the grand east side. The primary architectural scheme of the university in the 1920s was Georgian revival (I think). Things like Huff reflect and the union reflect that. When they added onto Huff Hall, DIA let some moron of an architect use a different style than the original building. I am certainly no architect, but know enough to hate the dis-symmetry. We have an architect that is using that hideous old NY Giants font on the side of the building. It must be the same architect that redid Assembly Hall and didn't know that the cheerleaders run the flag around at the top of section B, and now that's basically screwed up forever. If they don't know that we've changed fonts, can we trust their attention to detail? The six pack and other dorms built in the 1950's were done in a hideous USSR government building style. Thankfully they are being torn down, as they are just disgusting to look at. This facility looks much the same-not matching the stadium or Irwin. The point about the MI is well taken as well. How will they get into the stadium after the south facade is built? Certainly not from the east, as the new building will block anyone's entrance to that side. I sound like a crabby old man, but i really hate when we do things because they're affordable at the time, and don't do things the RIGHT way. This design is hideous and an embarrassment to both the people who designed it and to Josh Whitman for allowing it to be released to the public. I recently toured the campus for the first time in about 20 years (been in CA) and was super impressed by the new facilities and the revival of older facilities. We often get dissed for the lack of scenic beauty of CU, but the campus facilities and architecture are really, really good. This new design is just not up to par. Memorial Stadium is an architectural gem that should not be further tarnished (Geunther did enough damage with the luxury suite / press box design and the awful NEZ). Josh - please go back to the drawing board and get a better plan. Must be an Illinois thing. Soldier Field renovation is an abomination as well. I don't understand all the negativity. How is this anything but a HUGE positive for this program? The negatives are ridiculous: location and architecture/cosmetics? Really? The location can't get any better or any more functional. 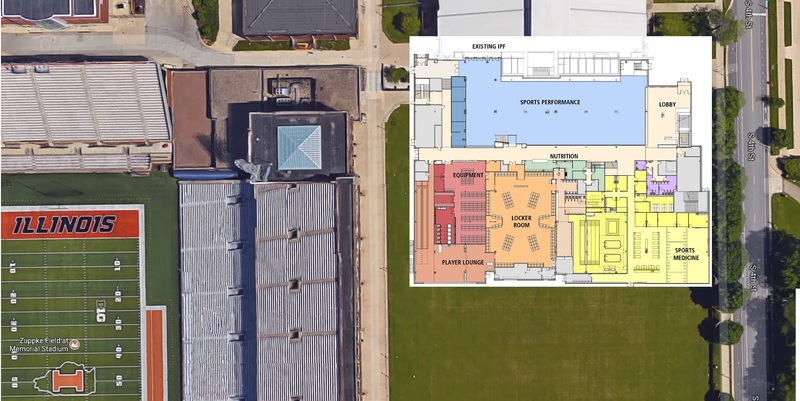 It is connected to the indoor practice facility, practice fields, about 20 feet from the stadium, and contains a new weight room and every amenity any football program (college AND professional) could need. The cosmetic/architecture argument is crazy to me. They tried to make a modern facility tied in with the existing buildings. Seriously, it's a 2 story building made primarily with the same brick as the stadium. Yes there's some glass and a terrace, but it looks great and very professional. I don't get the view of the stadium argument either. Where else would they build it? Very few people approach from that end that would actually notice the blocked view. The money view is from the west, and Grange Grove is designed exactly for that reason. This got more "ranty" than I anticipated, but seriously, this is a great design. The effect on recruiting will be huge. We're acting like big boys now.